There is an easy breathing exercise that is considered as being the perfect cough remedy. This breathing exercise was initially developed and used by over 170 Soviet and Russian medical doctors. What this exercise basically does is that it calms down the urge-to-cough receptors, and increases body-O2 content. It works just as well at night too. chronic cough is also caused by chronic inflammation because of positive body voltage. However, solving this problem is extremely easy, as it just requires normalizing the electrical voltage of the human body. So why is it that a majority of people suffering from bronchitis, asthma, cystic fibrosis, COPD and a number of other conditions suffer from persistent coughing? 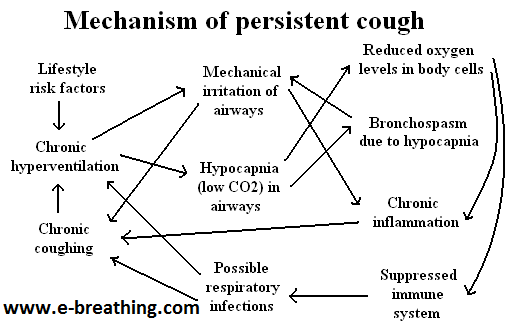 The chart given below depicts details of the mechanism of chronic coughing. 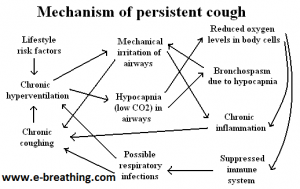 It is basically a self-perpetuating activity that typically leads to substantially more persistent cough. However, it can be resolved by learning how to cough correctly without reducing the body- and brain-O2 content. This way, inflammation will be reduced as well. Before anything else, you must learn how to cough via the nose, while having your mouth closed at all times. This is going to make it possible for you to reduce irritation of the airways, and bronchospasm. 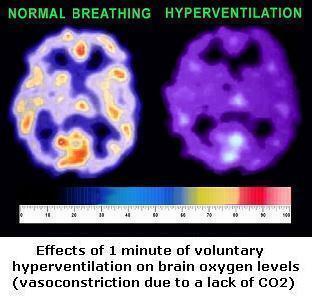 It will also help you increase oxygen levels in the brain and body cells. As soon as you gain complete mastery over remedy #1 – it might take you up to 1-2 days – you will have to learn how to cough with both your mouth and nose closed. All that you need to do is to keep your mouth closed, and pinch your nose. This is also going to play a major role in enhancing your body and brain oxygenation. Generally speaking, both of these extremely easy remedies are sufficient enough to reduce, and in some cases even stop bouts of persistent coughing. However, it is possible for you to subdue coughing even more quickly by using ‘reduced breathing’, which is also known as being the most potent anti-coughing breathing exercise. Place yourself in a comfortable position on a straight chair or an ordinary table. Now when you have a coughing bout, try your best to stay relaxed. At the end of your usual exhalation, hold your breath and pinch your nose while making sure that you mouth remains closed at all times. Continue doing so till the time that you experience slight discomfort. Now, if you find it hard to hold your breath because of severe coughing, just pinch your nose and close your mouth while coughing, thereby disabling any air exchange. Why is that so? Well, because you need to achieve your aim of increasing the CO2 content within your airways. This way, you will be able to calm down the cough-receptor cells that get irritated because of different mechanical and biochemical factors during acute bouts of coughing. These are the nerve cells that are basically responsible for stimulating the breathing centre in the brain both to trigger and to continue coughing. Once you are done with the breath hold, you will feel a distinct desire to take a breath. Here, however, you must only take a small, rather short, inhalation – more like a sniff. Remember that you must only do so via your nose. After taking this small inhalation, you should focus on relaxing all of the muscles of your body again. This particularly holds true for the muscles in your shoulders and upper chest, so as to exhale very slowly. See the fact of the matter is that in case there is coughing, it is vital for you to limit your gas or air exchange to a very small amount. Make sure that your exhalation is natural and unforced. Once done, take another small inhalation and relax again to exhale completely. You should basically aim to take a reduced or small inhalation with each breath. Relax even if you have a cough. Gradually, you need to create a rather distinctive air hunger while making sure that you relax all the muscles of your body. Soon, you are going to experience a strong desire to breathe more. However, don’t give in to this urge and maintain it till the time that your coughing subsides. The Russian medical doctors who developed this exercise found through extensive testing on thousands of their patients that chronic cough is only possible in people who have less than 20 second for their body-oxygen test. Subsequently, there is a permanent persistent-cough remedy that is known to slow down the automatic-breathing pattern so that it gets closer to the medical norm. This helps rather significantly in getting more than 20 seconds for the body oxygenation test. Generally speaking, this breathing exercise is largely considered as being amongst the most powerful cough remedies to have ever been known. Apart from this, there is yet another cough remedy that involves grounding the human body to acquire the same negative electrical potential as the Earth. This greatly removes inflammation due to free electrons. Just about anyone who achieves more than 30 seconds for the body-oxygen test 24/7 will experience complete relief from coughing. Remember, this is the ultimate cough remedy and can easily be achieved by applying the abovementioned breathing exercises and lifestyle changes that can enhance body O2.